Summary: Here are some sources for molds to make brains out of jello. 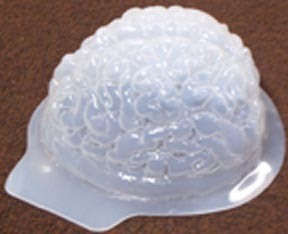 There are many ways to use the famous Jello brain mold, a mold that you fill with gray or pink Jello to make a model of the brain. Once it sets up and you turn it out of the mold the jiggly stuff is not that far from the texture of a real brain. For a firmer Jello, you can use the recipe on the side of the Jello box for "Jigglers." Jiggler Jello comes out firm enough to cut into cubes as finger food, so it holds together much better than regular Jello. The Jigglers recipe is on the Web. Flavors that give flesh-tone results include peach and watermelon with a few drops of green food coloring to darken them, but you can use any color, adding one 12 oz. can of light evaporated skim milk with no more than .5 percent fat. Gray is an obvious choice for "gray matter" but pink shows up better. For demonstrations it can be jiggled, dropped, smashed, eaten and more. Guaranteed eeeeew! You can order one from Archie McPhee for $7.95 plus shipping. It comes with the recipe for making brain gelatin. The Quiggle mold was available for $17.20 including shipping, from SKS Sibley Co., "Qwiggle-gel Products", P.O.Box 1351, El Segundo, CA 90245-9998. Phone 323-756-9880. The instructions are very good. We don't find it on the web any more, but a few were available on Ebay the last time we checked. As part of the video "Every Time Every Ride," a major promotion for equestrian helmets, there is a shot of a brain made of firm Jello tucked into a large Ziploc bag and then into a helmet dropped from 1.8 meters or so. The bag with the "brain" intact is then removed. When this was shot they also did a "no-helmet" drop which resulted in a totally messy pool of goo. (That didn't make it into the finished video). I have two of the brain molds and when I am doing a helmet safety presentation I sometimes bring it along for the (usually kids) to touch, impressing them with the vulnerability of the actual brain. It takes several packages of red and blue Jello plus some extra unflavored gelatin to get it right, but it's always a star when I go to the trouble. And here is a recipe for making the gelatin.